Well is it possible to have a "pinched" nerve? Can you actually "pinch" a nerve? Sciatica is a symptom of rediculopathy, a condition when pain or numbness is felt down the leg due to nerve impingement in the lower back. Often times a "pinched nerve" in the back is referred to as Sciatica, and it can be easily and effectively treated with Chiropractic care, physical therapy, and spinal decompression. Well generally speaking a never can become "impinged" or pinched and cause all sorts of problems, not the least of which is pain radiating down the leg. 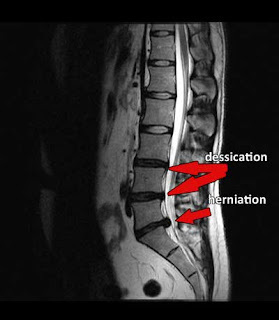 Often this can mean a disc herniation in the lumbar spine, and depending on where the herniation is there can be pain and a loss of motor function due to interference with the nervous system due to the pressure on the nerve. A herniation is when the neuclear material in the spinal discs, which cushion the vertebral bones, extrudes, or bulges out and starts putting pressure on the passing nerves. This can sometimes cause a "pins and needles" sensation down the leg, and the associated pain can sometimes be very bad, and its can become chronic and increase over time. The Spinal nerves and the cranium make up the central nervous system, and they in turn branch out to the peripheral nerves which provide sensation and proprioceptive feedback to the central nervous system, keep things moving, provide feeling and maintain the body's homeostasis. When a nerve's ability to communicate is hindered, weather by a muscle, an injury, or a disc protrusion, its does not equate to a long term uphill battle. There are many non-invasive treatment options, that can easily be combined, to treat muscular and skeletal issues that may be causing the nerve interference. Right on target Dr. Shoshany. The nerve that is irritated or rubbed because of a herniated disc is one that does not function well and WILL lead to more health problems. Your decompression system looks like something I would follow.